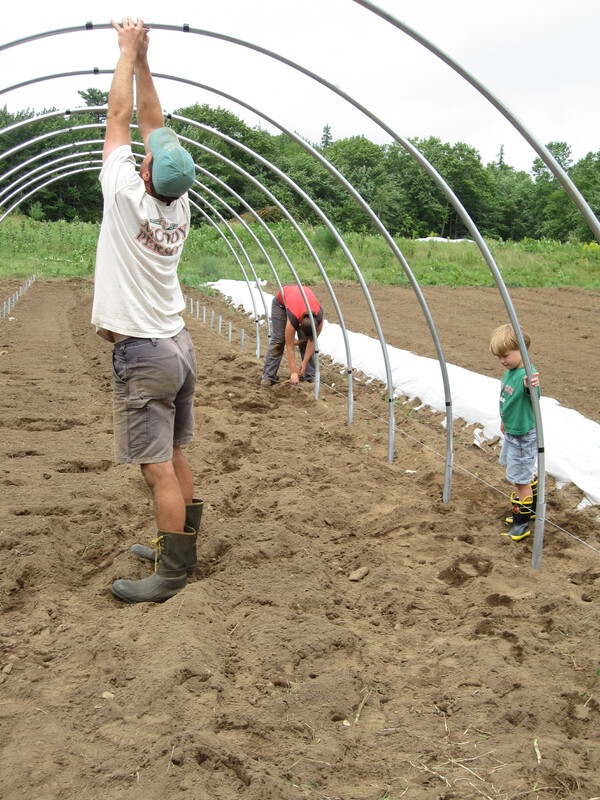 A new ‘small’ hoophouse is underway at the farm. Some of you may remember the “port-a-hoopies” that we built last summer. They were a bit of an experiment, and an experiment that was challenged by windstorms and early November snow. This new, equally ‘portable’ hoophouse ought to withstand the weather much better. It is created out of bent chain link fence pipes, instead of rebar like the last ones. We hope it will result in bountiful harvests well into the fall, as some of our late summer crops will be planted under the hoops. Something new for our members: farmers Marc and Abby Strobbe of Heathy Heritage Farm in Bremen are making their pasture-raised pork, poultry and eggs available to our members through a ‘Hatchet Cove FarmShare’ program. They will be delivering to our members every other Sunday in Rockland and to Hatchet Cove Farm every other Monday evening. Let us know if you’re interested, and we’ll email you all the details. We’re really excited to be connecting our members with such well-grown meat and eggs. If any of you have fennel left over from last week….a warning. I finally made the couscous salad that I put into last week’s recipe, and it wasn’t very good. Instead, a CSA member reminded me of another fennel recipe that she says is a summer staple in their home: Penne with Fennel, Tomato Sauce, and Blue Cheese. You can find it on our website (after clicking the recipe tab, click on the word ‘fennel’ —both recipes listed there are hits). Have a great week! We hope to have some exciting dairy cow news for you next week…stay posted, especially if you love raw milk!